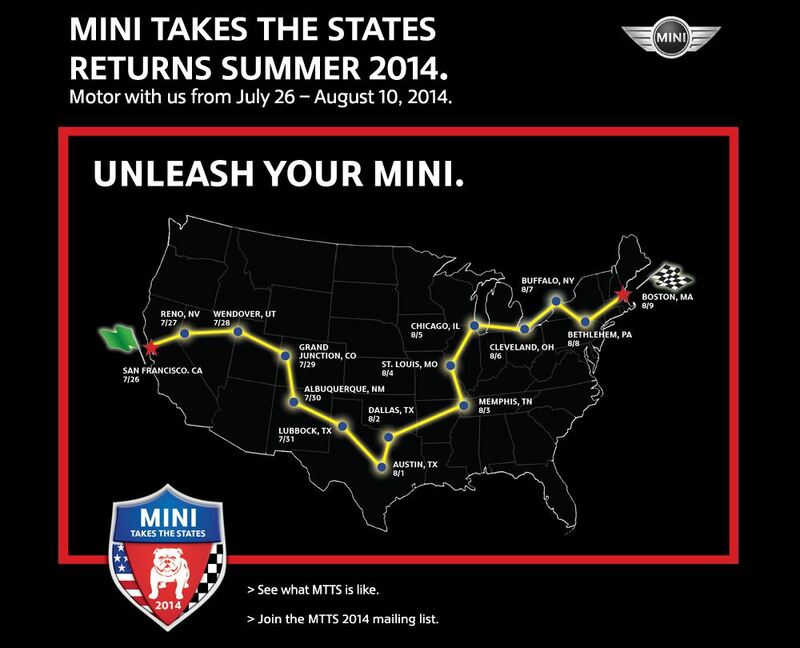 Hot off the MINIUSA website, the MINI Takes the State 2014 motoring route. Beginning on July 26, 2014 in the City by the Bay, beautiful San Francisco and ending in Bean Town, USA Boston Massachusetts on August 10th it is time to UNLEASH YOUR MINI. Fifteen different cities in fifteen days with loads of fun along the way. To stay up to date with the latest MTTS 2014 news, sign up for the mailing list by clicking here. Check out pictures from MTTS 2012. Check out the blog from 2012. All blogs from MTTS 2012 may be found under the MINIisms tab.